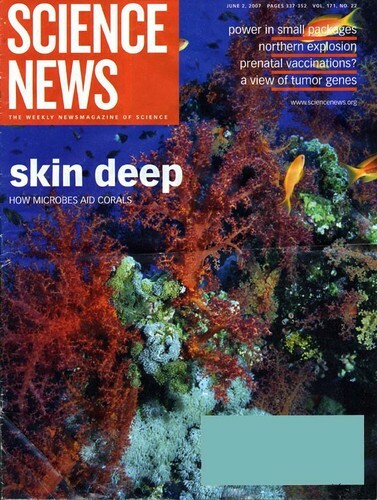 A few years ago reef keepers were often heard complaining that their SPS corals were dying from what was then called RTN (rapid tissue necrosis). It appeared that a mini plague was in process, and many believed that the causative agent was bacterial in nature – possibly Vibrio vulnificus. Things seemed relatively simple then: find the pathogen responsible and administer the correct antibiotic and RTN and related problems that beset corals would be taken care of. Oh, that things are so simple. Cover of Science News magazine. There appears to be little doubt that some bacteria, usually Vibrio sp., attack corals, but now it also appears that there are “hordes” of beneficial bacteria that come to the aid of corals under attack. Corals appear to be able to recruit beneficial bacteria to protect themselves from deadly bacteria. Much of this information is being intensely studied by marine microbiologists, and has far reaching significance as the ocean’s corals are threatened by global warming and human created pollution. For reef keepers, however, one thing is clear: the use of antibiotics may do more harm then good. Before dosing an antibiotic we need to know which bacteria it will kill, the beneficial or the deadly.